Whatever do they call them these days, bathroom sink cabinets or bathroom vanities? Either way, ours is done! Here's the process in pictures, with a few words thrown in to boot. The area we had to put a sink cabinet is not very deep, only 16 inches. What we wanted, was something that looked like a piece of furniture, such as a dry sink. Nothing ready-made would fit, so Dan had to make one. We started with the original base cabinet (photo here). Dan stripped, stained, and added on to it for the sink. Ready made legs were easy to find, but a top proved to be a little harder. We could find 1" x 16" stainable tops, but in reality they were only 3/4 inches thick. Dan didn't think this was sturdy enough so he bought the same 1.25 inch top we used for the kitchen dining nook table. Fitting the top, which was reconstructed from a purchased table top. It was 24 inches by 48 inches long, so he cut it to width and attached the remnants to both ends to make the vanity top longer. inch table top into a 16 x 55 inch vanity top. Back and end splashes made with 1x3s complete the dry sink look. Assembled, stained, and polyed, with back and end splashes. He applied extra coats of polyurethane, because it will obviously get water drips and splashes. The vessel sink came with an overflow. We added the umbrella drain. 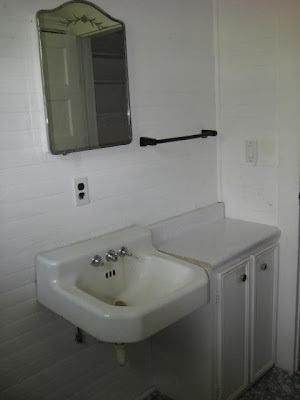 I liked the vessel sink look, and was surprised that they weren't any more expensive than a regular bathroom sink. Vessel sink faucet. In the entire universe I only found one in antique brass. We found good deals for both the vessel sink and faucet on eBay. That included free shipping. A look at the finished cabinet base with doors. Dan had to make new doors for the base cabinet. That was the last step. Finished sink cabinet with sink and plumbing complete. Done! I almost feel like I'm at some resort hotel when I stand there brushing my teeth. That was the last "big" project for the bathroom. What we have left are a number of little things: install the shower riser and rod, towel racks, mirror, and door. Depending on how many more rainy days we get for indoor project time, the hall bathroom may be done in no time. making seed pods now. Heirloom volunteer marigolds in front. little insect damage, just what you see here. I wish I'd planted more. mud. These are destined to become potato salad to accompany chevon burgers. Swiss chard (mostly for the goats) and volunteer 4 o'clocks front right. Funny, how nice my garden looks through the eye of the camera. When I go out there, all I see are the pathways overrun with grass of various varieties and overgrown plantain. I see the wiregrass taking over and everything that needs to be weeded and mulched. I mention volunteers in quite a few captions. As part of my work-smarter-not-harder companion bed planting, I tend to let all volunteers grow where they may. Sometimes I'm just curious to see how well they'll do with their new neighbors. Mostly, I find that volunteers are usually hardier than the seed I plant myself. Most importantly, I know that if the ground isn't growing something I want, then it will grow something I don't want! Those heirloom marigolds cover the entire walkway between two beds, and create a living mulch. Not much else is growing there with the added benefit (besides being pretty) that when planted in beds, those marigolds help deter nematodes. I'm still hoping to get a few more things in the ground. And soon, it will be time to begin fall planting. Amazing how time flies, isn't it? This morning I counted 8 yellow chicks. I gave Mama Hen 8 Buff Orpington eggs, so 8 chicks means the little guy made it! It was walking around last night but didn't seem to have much leg strength yet. Hopefully having other chicks to run around with will motivate it and all will continue to be well. The first egg hatched yesterday. I was out there giving Zed his 2 p.m. bottle when I heard Mama Buff clucking softly. I listened closely, and heard, "peep, peep, peep." Of course, when I drew near to take a better look everything became silent, and I wasn't allowed to see. At milking time I saw one chick head, a few hours later, there were two. That night I slipped the mail order chicks into the nest. Not exactly under Mama, but next to her and behind her. All I could do after that was pray she wouldn't be the wiser. It is with great relief that I can announce all is well. I haven't gotten in for a really close look, but it appears she hatched two of the original eight eggs I gave her. I had to remove extras a few times from buttinski hens who pushed Mama out of the way to lay their eggs. There were ten the last time I was able to check. In a day or so I'll remove the unhatched eggs. It's interesting that these mail order chicks, Silver Laced Wyandottes and Speckled Sussex, have stuck close to Mama. When I did this before, with Buff Orpingtons, they were out and about from first light, every chick for themselves. Breed personality, perhaps? Introducing the mail order chicks is a big hurdle and I'm relieved it worked out well. The next hurdle will be integrating all the chicks into the flock. Hopefully everyone will grow well and the next transition will go smoothly. Speckled Sussex (brown striped) chicks. The only problem, they were two days early! Based on a hatch calendar, I ordered Monday hatched chicks to arrive on Wednesday. This kinda messes up my schedule because I gave Mama Buff her eggs based on a Wednesday arrival and Thursday home hatch day. Oh well. I got 8 Silver Laced Wyandottes (Dan's choice) and 8 Speckled Sussex (my choice). We got a bonus, free, exotic rare breed chick for ordering. I believe it's the mostly black one in the lower right-hand corner of the above photo. No telling what it is. The chicks are all healthy, except for one splayed leg. I used the treatment at PoultryHelp.com for Spraddle Legs. I don't anticipate any problems with it correcting itself. There's nothing cuter than baby chicks, is there? Except maybe baby goats! One day, not too long ago, I headed out to the buck pasture to check on water buckets. Our big Kiko buck, Elvis, was standing by the gate. This shouldn't have been a problem, but because of his wild streak, I would always keep my eye on him and try to keep my distance. As I slid through the gate, he came up and took a swing at my leg with his head. He did, in fact, catch my inner thigh with one of his horns. It wasn't what I would call a gouge, but it did break the skin like a scrape through my clothes. That, added to a string of other things, was the proverbial last straw. Goats have a social hierarchy by which they live, If they don't see humans at the top, they will challenge the human's relative position in that hierarchy, and even try to dominate them. Elvis, having been raised with a herd of meat goats, was rarely handled when young. At best he was friendly sometimes, curious always, but never tame. We worked on that and I thought we'd made progress. He'd sometimes let us scratch and pet him, but never for long. He was always leery, and had been doing some mock challenging ever since we got him. He did some rearing up, pushed occasionally, but never charged us. Because of all that, I took care when I entered any of the buck areas. He took advantage, however, when I had to latch to the gate. It got to where I would never enter the buck pasture without the goat buster. I already knew Elvis was a jumper. He jumped two fences to get to Ziggy, the result being the triplets. Not that I'm not pleased to have them, but that was supposed to be poor Gruffy's job. Elvis had also taken to trashing testing the fences. I'd watched him hook his horns in the welded wire and pull. He managed to loosen it from t-posts in several place. One day I watched him ram the fence in a spot I'd recently fixed. Both he and Alphie, one of our two, three month old bucklings, had slipped through an opening he'd made, leaving me mystified as to how they got out. Until I discovered their secret opening in the bushes, that is; a place where we'd spliced two rolls of fencing. Another time, Alphie, the self-appointed alarm goat, started hollering. We went to investigate and discovered that Hooper, our other buckling, was in the next door neighbor's yard! We were not only baffled as to how he got there (jumped? ), but also, how to get him back, because he still wasn't letting us catch him. (This is, in fact, how he got his name. While we were trying to figure it out, we began referring to him as Hoppity Hooper, thinking he'd jumped the fence.The name "Hooper" just stuck.) It turned out that he'd slipped through another opening Elvis had made. In addition, Elvis trashed the hay feeder Dan made for the boys, kept pooping in the mineral feeder (I know it was him 'cuz he was the only one tall enough to do it), plus knocking over the cinder block I kept in front of the mineral feeder for Gruffy to step up on. Not to mention he was constantly pushing all the other bucks around. We had to tend to Gruffy's broken scurs on more than one occasion because of it. (Scurs are the remnants of horns that grow after kids have been disbudded.) Elvis had become a real nuisance. So what did we do? Firstly, I listed him on Craigslist. I wasn't especially hopeful about this option, because Craigslist is always overloaded with ads for bucks. Bucks, even the little guys, are hard to sell because there are so many of them. After about a month, I had one inquiry from someone who wanted a buck to breed their does who would be safe with children, but I had to tell him that wasn't Elvis. (Good luck with that one. Even Gruffy, who has a gentle and affectionate personality most of the year, is a different animal in rut. I give him a wide berth then, and never turn my back on him). If one breeds animals such as chickens for eggs or dairy animals, then what to do with the extras is always a question. Extra females are usually easy to trade or sell. Extra males are not. From the beginning we decided we would raise goats for milk, manure, young, to trade or sell, and meat. That means the extra animals are not unwelcome. If we couldn't sell him, we would have to decide whether to take him to a meat processor or do the job ourselves. This is the question we discussed. When Jasmine's broken shoulder never healed properly, we opted for the processor. There were emotional reasons for this, but also, we weren't ready for that yet. However, it has always been something we've planned to do eventually. It's tidier to have someone else do it, both physically and emotionally. On the other hand, there's a lot of waste. Dan hates waste. The bottom line, however, is if our goal is self-reliance and we eat meat, then we should take responsibility for it. In the end we got the proper equipment and did it ourselves. No photos. Actually Elvis was never considered a permanent addition to the herd. I needed him to breed my Nubian does, and as a companion for Gruffy, I hoped, until Alphie was old enough. The breeding part worked out well, but being a companion for Gruffy didn't. Elvis was constantly pushing Gruffy around, apparently for the sport of it. Oftentimes Elvis wouldn't let Gruffy into the buck barn, especially when the hay feeder has been filled with fresh hay. Elvis did the same thing with Alphie, and then Hooper. Goats don't like change but I doubt Gruffy or the little guys will miss him. I hate to say it, but neither do I. I think we'll all appreciate the peace and quiet. 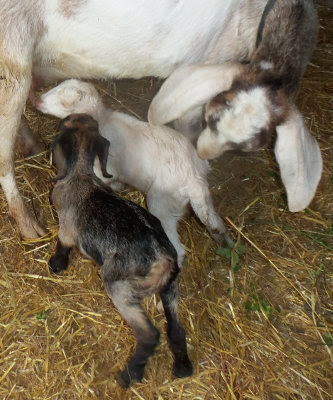 As promised, here is a look at 2013's crop of goat kids. From 3 does we had a total of 7 kids: a single, twins, and quads. All survived except one, and our total goat population doubled to 12. Surprise and Alphie, who is just learning to stand. At three months of age, Alphie now lives with the bucks. Weaning was tough, but he's a big boy now and is buddies with Hooper. On May 8th, Lily gave birth to twins. Daisy May, 5 weeks old. It's interesting how their colors change as they get older. If you look closely, you can see that Daisy isn't actually the solid white she has appeared to be in her photos so far. She is white with light gold or cream markings. This is a fairly common Kiko coloring. You can see Rosie's one white foot in this photo. On May 27, Ziggy, at long last, gave birth to quads. The births were easy, but sadly, one was stillborn. their paternity, but likely they are all half Kiko, half Nigerian Dwarf. Zoey was Ziggy's firstborn and the only surviving doeling. Buster Brown was second. He's the biggest and most boisterous of the three. Zed was born last and is the littlest. Zed is my bottle baby. Zed always comes to see me. At first, Ziggy's two little bucklings had trouble finding her teats. I was concerned about this and started them both on bottle fed colostrum. The colostrum was extra from Surprise, which I had frozen in muffin tins for emergencies. I offered the bottle every three hours during the day, but not at night, so that they would learn to go to Ziggy. This worked for Buster Brown, but Zed was always getting pushed out of the way by his brother and sister. Zed in the foreground, Buster Brown behind the bucket. Like Daisy May, Zed has faint cream spots too. Soon, Buster Brown was nursing exclusively along with Zoey, but there never seemed to be enough leftover for Zed. Even when I would put him on Ziggy she would walk away. She would look at me as if to say, "I'll babysit him but you have to feed him." It's as though she knows she can't make enough milk for all three. Zed, Buster Brown, & Zoey bringing up the rear. As they get older, I'm still not certain Ziggy makes enough milk, even for two. When I was milking her last year for all those dairy goodies, at best I would get 2 & 1/2 to 3 cups, twice a day. It seems that now, Buster Brown gets frustrated sometimes. I've taken to offering him the bottle after Zed. Sometimes he's interested, sometimes not. Having never bottle fed kids before, I did some reading up on it. Pat Coleby, in her Natural Goat Care, seems to think that too much milk is not good for kids. This puzzled me. My own maternal instincts kicked in with, "but shouldn't they get as much as they want?" I'm guessing, however, that if they are full of milk, they won't start eating as much solid food as they need to develop a good rumen. In observing dams with their kids, however, I note that all of them begin to walk away from their nursing kids after about a week or so. The kids nurse when they want, but the amount because increasingly limited by their mothers. In turn, the kids begin eating more solid food. Eventually, the mother weans them by this method, until she finally doesn't let them nurse at all. Zoey, Buster Brown, and Rosie. Rather than increase the time between bottle feedings, I decided to follow the goat moms example and start to limit the amount Zed can have, and Buster Brown too. They nibble grass, leaves, and hay now, which is as it should be. Zoey, with Buster Brown and Rosie who are still going at it. Their game is great fun until Ziggy chases Rosie away. In regards to herd dynamics, Surprise is the queen, but not a benevolent one. She is a bully, but seems to be accepting the twins better, now that the triplets are on the scene. She still won't let them in the stall, especially Daisy, but she tolerates them. She and Lily are buds, and the twins hang out with themselves, unless Rosie is investigating the little guys. Ziggy is still very businesslike in keeping the others away, especially the twins. I am still cautious, and don't leave them all together if I have to leave the property. Some things, they'll have to sort out for themselves. In spite of the mean queen, the kids are happy and growing well. And that's a lot to be thankful for. The other day I transplanted some sweet basil and parsley seedlings I'd started indoors. They needed watering in, so I figured, why not use rainwater. It was the first time we've used our rainwater for anything. Not that I had any doubts, but I was really curious as to water pressure and how well the water would flow, or drip, as the case may be. The only problems I had were with the soaker hose itself, in places it wanted to kink. The pressure was fantastic and I was well pleased to not pay the county for the water for my new transplants! In some ways, it seems ironic that I should be posting about irrigating. I planted those little guys on May 30, and since then we've had over 5 inches of rain. I'll be surprised if they don't end up floating away. For a complete look at our rainwater collection system, click here.